My dear friends K and J got married two weeks ago – it was a wonderful, happy day. 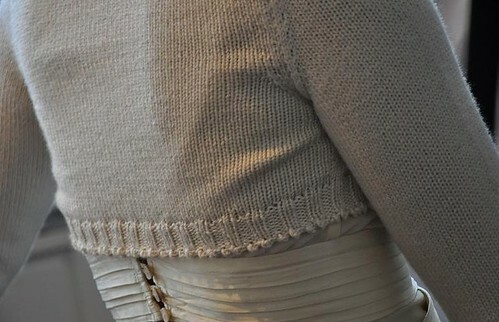 Modifications: I knit the body in one piece, and made the sleeves top-down to get the length right. I cast off with a picot edging. Otherwise I just followed the pattern as set. 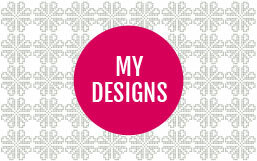 Notes: I must admit that I’m not the hugest fan of Debbie Bliss’s designs. I used this patterns as it was the closest to the sketch that my friend had made, and I didn’t want to spend any time working out a design of my own as the schedule was quite tight on this project. 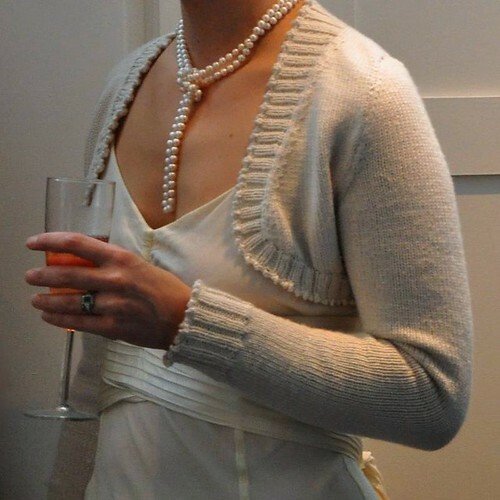 If I was going to make a similar shrug again, I would make the fronts slightly smaller, leaving room for much more ribbing, which I think would make it look more glamorous. K also asked me to read a poem at the wedding. I chose one one that I came across quite recently; it’s fairly long, but I thought I would share it with you here. Oh that is just gorgeous! Absolutely perfect with her dress. Love it. What a lovely bolero, the color is perfect for her gorgeous dress too! The poem is beautiful. What a beautiful knit, beautiful bride and happy couple! Very beautiful knit, very beautiful poem – thanks for sharing both! What a gorgeous bolero! It looks stunning with the dress. I do see what you mean about the ribbing. I’ll keep that in mind for future reference. And the poem is gorgeous! Where did you find it? I’m going to have to bookmark this post to remind me to get hold of a copy. 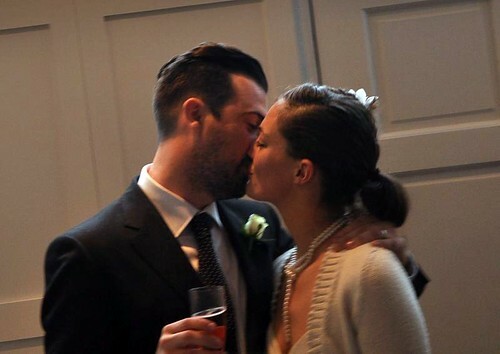 thanks for posting….weddings make me cry….in a good way. Beautiful all round. Great job on the Bolero! Oh my…the bolero is fabulous…and the words on the invite…perfect! oh, great poem! And the bolero looks fab, just perfect with the dress and so beautifully knitted. Very special gift. The bolero is gorgeous!! It is the perfect piece for the dress. Beautiful shrug and beautiful poem! You made your friend the most beautiful Bolero ~ it fits her like a glove and is so feminine ~ perfect for a bride! I love the poem you shared. Too often we are so busy we forget what it means to be present “in the moment” with ourselves and others. that is a beautiful bolero!! and the poem… well that’s just exactly what those in a relationship should consider. beautiful! I was wondering when we would get to see it. It is really lovely and I’m sure she will treasure it. How lucky to have something from her wedding that she can wear later, AND made by YOU. How so romantic the bride looks. Gosh, the knitting is beautiful and the poem. That is a really lovely piece of knitting (the picot? perfect!! ), it complements her dress beautifully. And the poem. Thank you so much for sharing that. and that poem – ah, that poem. Just perfect. I too am bookmarking it and tucking it away. I’ve never heard something so apt read at a wedding. Beautiful shrug! And the poem; that was our wedding poem!